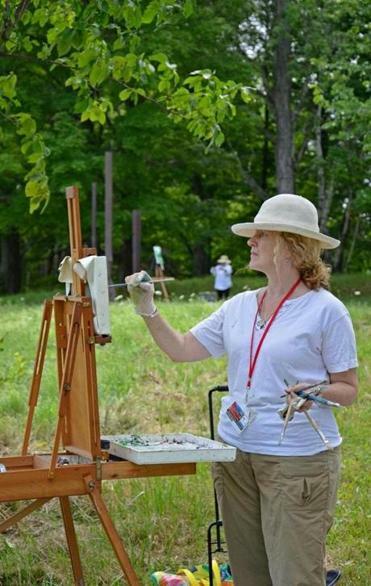 Melissa Bowen Rubin of New York enjoyed a morning of landscape painting amidst the natural beauty of Bennington, Vt. at Art New England. BENNINGTON, Vt. — It looked like a painting: the emerald field spreading out in every direction, backed against a mountain range that seemed to fade to purple in the midmorning haze. It was the kind of scene a painter like Melissa Bowen Rubin might dream about. This, however, was no dream. It was just another day at Art New England Summer Workshops, held annually at Bennington College, where artists come for a week or more of instruction, unfettered access to materials and studios, and a chance to chase the muse without the demands of home and work. “This is really a return to art for me,” Rubin said between brushstrokes. The New York resident was happy to be painting again, she said, after school and career had pulled her away. She picked a great place to stage her comeback. This southwestern Vermont town nestled between the Taconic and Green mountains is truly a spot for the creative with its natural beauty, bucolic bliss, and architectural wonders. Art New England welcomes artists like Rubin who are returning to the easel, as well as novices, pros, and many teachers looking to sharpen or expand their skills in any one of a number of disciplines. 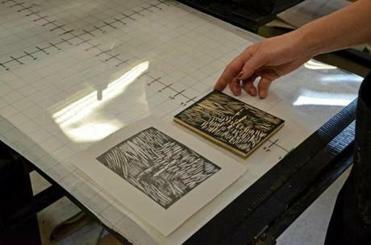 The woodcut and resulting print created by an Art New England participant, Gillian Furniss of New York City. Art New England has been around for nearly three decades, beginning as an outgrowth of the magazine of the same name. Massachusetts College of Art and Design purchased the program in 2001. That’s when Nancy McCarthy, painter, administrator, and adjunct faculty member, began managing the program, along with Joe Doucette, college administrator and artist. CeCe Sloan, a veteran from the program’s founding days, is still active as an on-site manager. 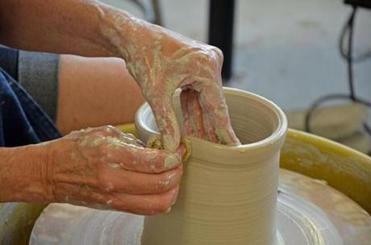 McCarthy said the reality is that for most professional, teaching, and amateur artists summer is the only time they can devote themselves exclusively to improving their skills and technique. Amy Orange of Great Neck, N.Y., worked the pottery wheel. Bette Bussel, executive director of the American Camp Association-New England, agreed. “For adults, to be in a 24/7 environment where lodging and meals are taken care of allows everyone to unplug and focus on all camp has to offer, including the opportunity to meet new friends and the chance to explore and build new skills,” she said. The focus at Art New England isn’t hard to figure out. The accommodations — primarily dorm rooms in Colonial-style houses with communal bathrooms and no air conditioning or television — are a far cry from the Ritz; and the food, though fine and plentiful, is served cafeteria style. If a fancy room and five-star cuisine top your list of vacation musts, this may not be for you. However, if creating art with like-minded folk under the guiding hand of established artists in blissful surroundings is, then by all means, book now. Jay Ryan of Fairhaven refined his portraiture skills. Participants come from all over to choose from the three weeks of offerings. During our time at Bennington, a couple from Europe was on hand for the extended-stay program, though a quick glance at the parking lot revealed that New England and New York license plates dominated. The participants, who average in age between 35 and 50, come not just for the instruction, 24-hour studio access, and camaraderie, but also the trimmings: nightly “life drawing” sessions, faculty lectures, and on-site exhibits featuring their work and that of their instructors. Still, it’s hard to believe that even the most dedicated artists envision their vacationing selves kneeling on the floor of a small college chapel with a piece of chalk trying to capture on paper the subtle textures of the tile. But Tom Lewis, a retired architect from Watertown, said he couldn’t think of a better way to spend his downtime. Meanwhile, in room after room of the college’s Visual and Performing Arts Center, with its large windows and seemingly endless classrooms and studios, artists sketched models, made prints, fired pottery, and painted. 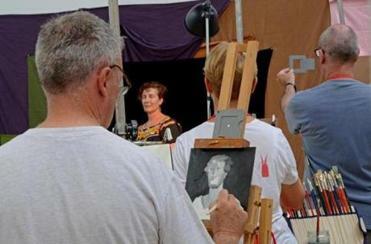 Others positioned themselves and their easels outdoors. The faculty for each week comprises artists who have exhibited around the world and excel at instructing. They teach technique, but in addition give the participants plenty of time to work. One morning, we came upon Jay Ryan of Fairhaven working on a portrait of a live model while instructor Catherine Kehoe offered occasional guidance. A floor below, Deborah Rosen rolled clay to the beat of a reggae song while getting her work ready to be fired. “I can’t do this in my apartment in Brooklyn,” she said. What free time there is can be spent enjoying a trip downtown to check out the local galleries, leisurely walks around campus, or a late-day gathering watching the sun sink behind the mountains. “It’s a real family atmosphere,” McCarthy said. The art world can be a place of “sharp elbows,” she added. There’s none of that at Art New England. Instead, there’s an all-for-one ethos that’s a hallmark of the program, and a true generosity of spirit pervades. Many of the artists we spoke with were Art New England veterans, including Deb Arter of Damariscotta, Maine, who’s been coming for two decades. Then there were relative newbies, like three-timer Corinna D’Schoto of Jamaica Plain, a MassArt student who interns at the camp in order to participate in a workshop. “It’s been awesome,” D’Schoto said, as she worked on a small painting in the Vermont sunshine. With most individual workshops capped at 12 participants, the majority last summer were booked to capacity. The schedule for this summer has been posted and includes many different styles of painting, as well as woodcutting, ceramics, 3-D art, drawing, papercutting, sculpture, and printmaking. McCarthy said she sees real and meaningful progress being made during each Art New England session. “It’s pretty extraordinary what happens,” she said.